This card is entered into the Crazy Crafters Team Highlights. Click here to see all of the entries and vote for your favourites. I do like to get my money's worth from my products - especially the higher priced items like dies! In this card, I've used a stencil that I cut from a piece of Window Sheet with one of the Stained Glass dies. The Window Sheet is quite strong so I'll be able to use this stencil over and over again. The base card is Night of Navy with layers of Silver Foil Sheet and Granny Apple Green before the inked layer. I wrapped a piece of the retiring Night of Navy Corduroy Ribbon around the top two layers before adhering them to the card with Stampin' Dimensionals. The decorations on the card are the retiring Petal Passion Embellishments and a Silver Foil dragonfly cut with one of the Detailed Dragonfly Thinlits. TIP: For easy adhering to the card, first place Multipurpose Adhesive Sheet on the back of the Silver Foil then cut out using the Precision Base Place in the Big Shot. The head and body are decorated with some of the new Faceted Dots that will be available in the new Annual Catalogue. To create the inky layer, I first started with a piece of Watercolour Paper (which happened to be a leftover piece) and spritzed it randomly with Crushed Curry and Bermuda Bay inks. When it was dry I used the Ghosting Technique with one of the Pattern Party Masks: place the mask on the dry, inked paper and spritz generously with water. Immediately lift off the mask. Let the water sit for a few moments and then blot with some kitchen paper. I then let it dry completely. Using the same mask (now nice and dry), I randomly and lightly sponged small sections with Blueberry Bushel ink. The next step was to use my home-made stencil and sponge with Blueberry Bushel ink. TIP: I masked off the area to the side of the stencil so that I could get a clean line with my sponging. Also, the stencil is smaller than my paper, so I started in the middle and taped it down at each end with washi, sponged and then moved the stencil - lining it up carefully - and sponged again. I used one of the new Artisan Textures stamps and Blueberry Bushel ink on the edges and corners of the paper and then stamped the flower from the Touches of Texture stamp set. TIP: Using the wonderful Stamparatus, I was able to keep stamping the flower image until I was happy with the depth of colour of the image. I watercoloured the petals and leaves with Bermuda Bay and Call Me Clover ink. 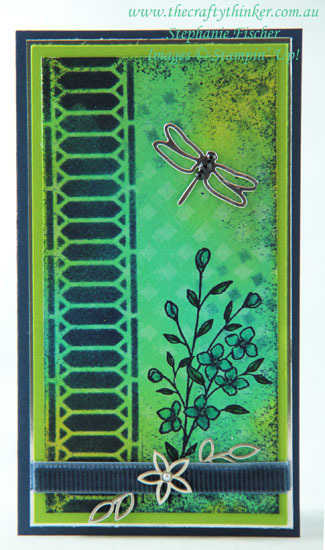 TIP: To get the small sized dragonfly that I wanted, I used the multiple dragonfly die and carefully separated one out with my snips.